We have divided South Australia into 6 Regions so we can effectively manage our organisation and provide a responsive emergency service across the state. A Regional Commander manages each Regional office locally. The Regional Commander reports to the Director, Regional Operations who is based at State Headquarters. Region 1 covers an area of 10 000 square kilometres of the Adelaide Hills, Fleurieu Peninsula and Kangaroo Island with a population base in excess of 250 000 people. The region offers great diversity from the urban area surrounding Adelaide and the large communities of the hills, through to rural activities including cropping, grazing and world class wine regions. The region also includes substantial areas of national parks, local sanctuaries and forestry reserves, which are home to a diverse range of flora and fauna. Crews respond to the full range of emergencies including: bush and grass fires, structural fires, road crash rescues, and hazardous materials incidents. Region 1 has over 3 000 dedicated and highly trained volunteers who staff 83 fire brigades and respond to thousands of incidents across the region each year. Whilst Region 1 has the smallest geographic area, it has the most volunteers and responds to the largest number of incidents. Region 2 covers about 17 000 square kilometres and includes the Mount Lofty Ranges north of the Torrens River, Mid North, Clare Valley and Yorke Peninsula. Land use varies from agriculture, vineyards, wine production, manufacturing, national parks, commercial forestry and urban/rural living. Region 3 is a diverse region, covering 54 000 square kilometres. The Region's agricultural activities vary from dry land cropping and grazing to large areas of irrigated fruit, wine and vegetables. Apiarists are active in a number of park areas within the region. Tourism within the area continues to flourish, with an annual increase in houseboats and the potential for associated problems. The number of vehicles passing through and visiting the region contributes to the overall number of highly traumatic incidents, particularly on the Dukes Highway. The increasing amount of chemicals being used in the area is creating ongoing problems with hazardous material incidents. Region 4 covers the Mid North, Flinders Ranges, North East and North West Pastoral areas, approximately 700 000 square kilometres or 66 per cent of the state. Farming, sheep, cattle and grain production are the main commercial activities in the region. Mining also takes place in the northern areas of the Region. This area is known as the "Gateway to the Outback". Region 5 covers about 20 000 square kilometres of the state, with a population of 70 000 people. In general terms, it covers the Upper and Lower South East. With reliable rainfall and abundant underground water, the Region has a strong history as a wealthy agricultural area. The wine growing district between Penola and Padthaway is one of Australia's best wine growing districts due to its favourable combination of soils and climate. There has been recent rapid expansion of both viticulture and other horticulture. The South East of South Australia represents 85 per cent of the state's forests and is a $1.7 billion dollar industry with an annual growth rate of two per cent each year. The region has a history of significant fires and other emergencies that affect the community. The community faces increasing risks as economic growth continues with industry expansion. 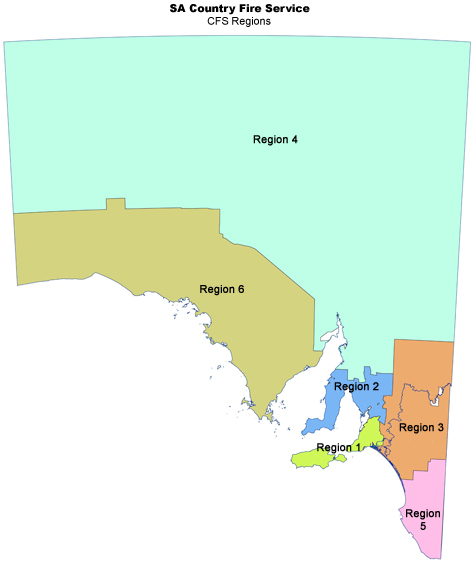 Region 6 covers the West Coast and Eyre Peninsula areas of the State. This is about 188 000 square kilometres or 20 per cent of South Australia's land mass. With a population of 33 000 people, it is the largest settled area of any of our regions and is about half the size of Victoria. The major road network in the region is National Highway One, which runs East-West across the north of the region. The Eyre Highway is the main corridor for heavy freight vehicles, passenger coaches, tourists towing caravans and single light vehicles linking the eastern states and Western Australia. At present, more than 140 000 vehicles travel along the highway each year. It is predicted that commercial and tourist traffic will increase significantly over the next decade. The region relies heavily on primary industry for its economic viability. The bulk of their income comes from agriculture, principally cropping and wool, and aquaculture consisting mainly of tuna farming and oysters.